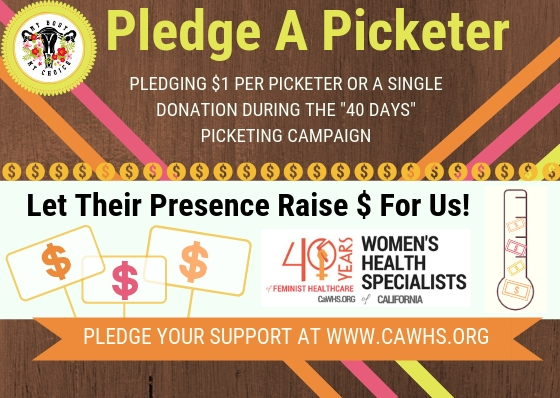 Pledge A Picketer- Here is how it works! Decide which pledge is right for you and how much you want to give to support Women's Health Specialists. We will track how many picketers come to the clinics each day. At the end of the campaign, we multiply your pledge by the number of pickters. By the Monday following the campaign, we will send an email with your gift total and donation link. When you honor your pledge, you provide Women's Health Specialists with support in providing crucial health services in our community! Your gift will not exceed this amount. Your name will remain anonymous to public.